The internet is a place to showcase unique and exciting approaches to boring old concepts. From viral phone destruction videos to creative error pages, it’s important to stand out from the competition by making basic web functions and content fun and inviting. In this feature, we’ll look at some of the ways progressive websites are taking unique approaches to standard content in a time of oversaturation. For the most part, website navigation menus are boring – and rightly so. After all, the purpose of a navigation menu is to direct the user to a particular page or resource. That’s not something that needs to be overly complicated or unique; simple is typically best. However, certain websites can get away with putting a unique spin on the traditional navigation menu – SensiSoft is one of those companies. 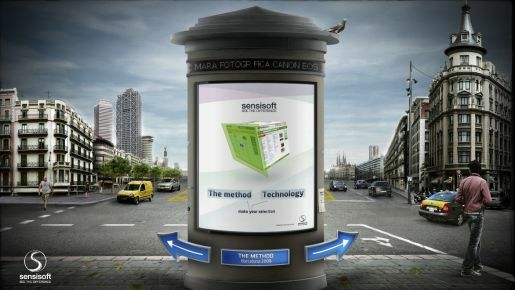 In order to make a splash and help visitors connect with their website, SensiSoft uses a familiar-looking information stand in the middle of the homepage. There are also moving parts in the background, including a horse-drawn carriage, British flag, and discarded newspaper. Pressing the arrows on the left or right side of the information stand spins the visual and directs the user to another page with entirely different visuals. The website does a lot of other unique things, including integrating resourceful content, utilizing background sounds, and more. While the website may take longer to load – and can overwhelm unsuspecting visitors – it’s enough to grab the attention of most and naturally encourages them to stay longer than they would on a traditional site. ‘About Me’ pages are notoriously boring. They typically highlight the best features of an individual and generally leave the reader with a somewhat positive notion of who the person is. It’s also trendy to throw in an odd trait or behavior that comes across as humorous. For example, “When John isn’t building computers, he’s watching funny cat videos on YouTube.” Some people laugh, most don’t, but it’s the hip thing to do. Well, AppJet founder Aaron Iba didn’t want a traditional or boring page describing who he is. Instead, he decided to let his psychologist explain it. To be more specific, he scanned the actual copy of his 7-year old psychological evaluation onto his website. Now that’s humorous and interesting. The sub-par quality of the document makes it even better. With quotes like, “Regarding school, he complaint that he feels ‘bored’ and that he ‘hardly enjoys anything, except lunch,’” are reason enough to read the entire report. Iba’s ‘About Me’ page just goes to show that you can put a creative spin on just about anything a traditional website has to offer. It would stand to reason that GotMilk.com would have a fun, unique website. While the homepage may seem boring and traditional, clicking on any of the five sub pages on the left hand side of the screen will bring up unique and compelling graphics. Boring topics like health benefits are made exponentially more intriguing with immersive clouds, patches of lush grass, and a cow that moves around. Recipes are featured in a virtual cookbook surrounded by a traditional glass bottle of milk and a blender. Clicking on the oranges and lemons at the bottom of the screen will actually blend them in the blender. It’s certainly a unique way to present a site that would otherwise be quite basic and bland. While we’ve looked at a couple examples of complex, immersive web design experiences, it should also be noted that simple navigation works better for many websites. Unfold is a perfect example of this. Their navigation menu is simple, clean, and streamlined. There’s a little movement to draw the reader in, but the actual pages aren’t distracting or over-the-top. As a web designer or website owner, don’t settle for traditional. Make a habit of defying norms and establishing new standards. While certain situations call for particular designs and layouts, you likely have an opportunity to be more creative than you actually think. Use these four websites as examples and don’t be afraid to try something new. It’s certainly worked for these websites.